For my bike I chose a folding lock as the extra lock. I choose one of the lighter versions, which still weighs around 700 grams. 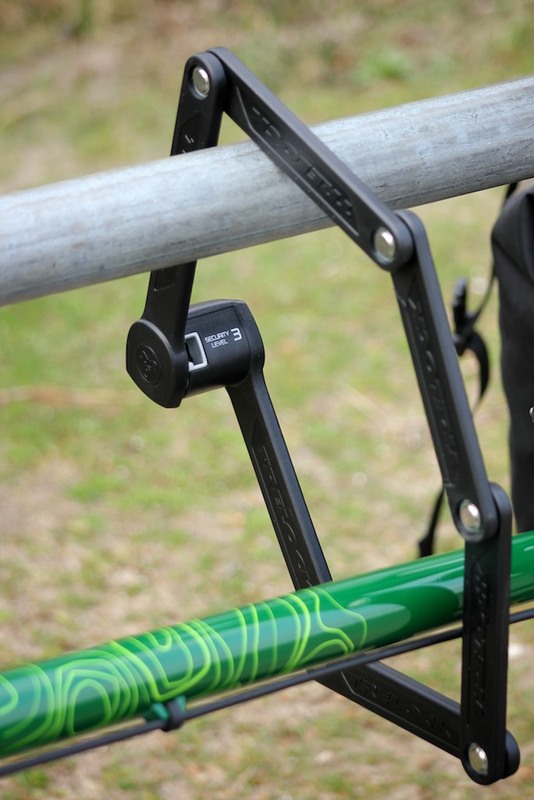 It can be mounted on a water bottle mount inside the frame so you dan easily take it along. I opted for the lighter version because I don't believe a bigger and heavier lock would help much. It would delay a thief with an angle grinder a few seconds, but that is about it. More expensive locks do sometimes have a better cylinder that is harder to pick, that might delay the more sophisticated thief that does not rely on brute force. The lock uses a key, is 85 centimeters and black. It is also available in the colors red and white, with a leather case, a longer version that is 110 centimeters and one that uses a 4 digit code. I will be using this as a secondary lock to complement the Axa Defender ring lock. On my 20.5" frame I mounted the case on the seat tube. On there I can just pull it out without hitting the top tube. For my girlfriend's smaller 19" frame I had to mount it on the down tube where there is more space. I found there be very little difference in where you mount it. I don't have a strong preference either way. If you have a water bottle cage in the frame as well, just put it where you can reach your bottle the best and put the lock in the other one. It also comes with two plastic hose clamps that you can put anywhere on the frame, even if you don't have any bottle mounts, but I did not use these. Using the lock is a bit of a mixed bag. I like that it folds into a small package that you can easily mount on the frame. However the folding segments behave differently than a chain and it can be a bit awkward fitting it around the bicycle as it only folds in one dimension. The total length is 85 centimeters, but once you put it around something it you only have less than half that length to work with. The length is sufficient to lock the frame and front wheel together (as the rear wheel is already locked by the primary lock). Locking the bicycle to anything else requires it to be quite close. Since I have two of the locks they can be locked together to create a bigger loop. I have not had to do this yet, but I imagine it can be useful in some situations. I have done this several times now where the individual locks were not large enough but, with both of them together I could fit them around a fixture and two bicycle frames. The keyhole is covered with a dust cap to keep dirt out. To put the key in you need to put the key next to it in a little indentation to push the dust cap away. The key is reversible meaning that you cannot put it in the wrong way. 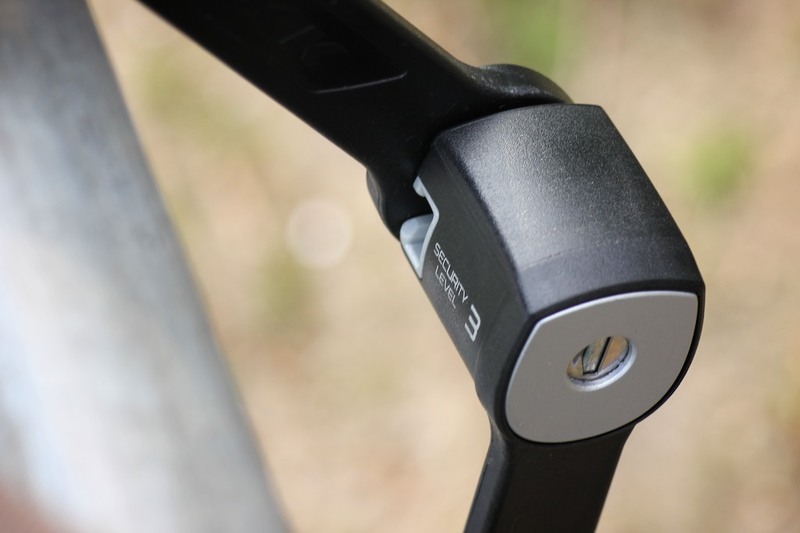 Because the folding lock cannot be bent you can end up with the keyhole being in an awkward angle depending on how you put it on the bicycle. Update March 2016: After having the lock for over two years I am pretty satisfied with it. 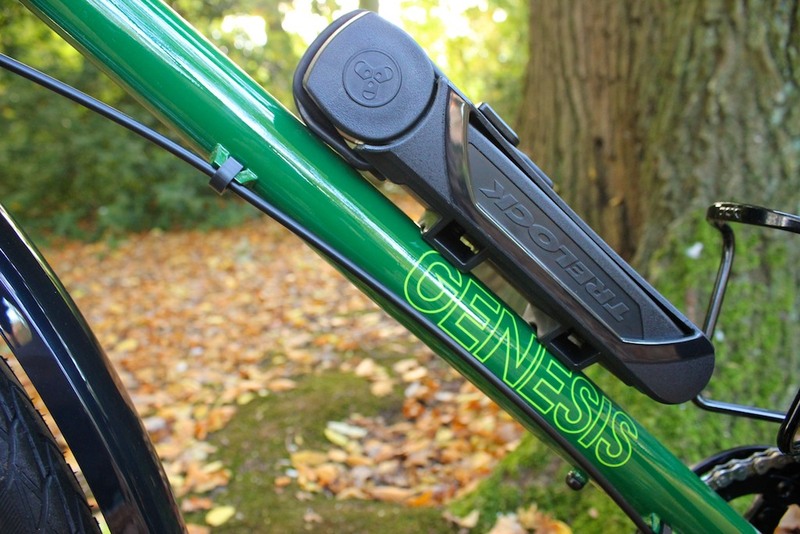 In 2015 one of the folding locks protected the two bikes from being stolen when the Axa Defender was compromised by a bike thief who tried to open it through the cylinder. What kept him from taking both bicycles is that there was one folding lock holding both bicycles' front wheels together. Since the Axa Defender was broken I have been using the Trelock FS 300 as the primary lock. It's slower to lock up and pack up. With the frame bag on it's very difficult to remove to from the case, and in winter with gloves on it is even harder. This sometimes leads me to not using the lock because it is such a hassle to remove it from the case. I have been thinking about cutting open the plastic case with a hacksaw to make it easier to insert, just like some of the newer folding locks have, but I haven't gotten around to that. Besides that, the lock is still going strong after two years, I dropped and scratched it a bit, it has been in the mud rain and snow. It's still working, the keyhole cover kept things out and it kept my bicycle from being stolen from an actual thief without being damaged. Folding lock on the down tube. Bicycle locked with folding lock on a horizontal metal tube.